According to a survey conducted by Statista, one of the leading statistics independent companies on the internet, Caleffi is once again this year one of the 400 best Italian companies to work for. Like last year, the survey was conducted through sample (and anonymous) interviews of employees from companies that have at least 250 people working for them in Italy. Among the 12 questions asked, the core one was “On a scale from 0 to 10, how likely would you recommend your company to a friend or family?”. We wish to highlight that the survey has a completely independent nature. 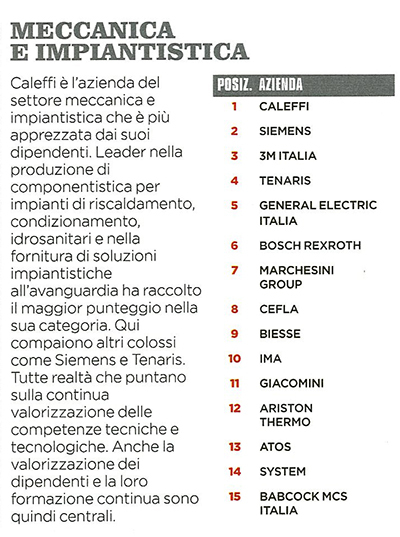 In its sector, Mechanics and Plant Engineering, Caleffi is ranked first, before the Siemens giant. We will of course continue on this path!